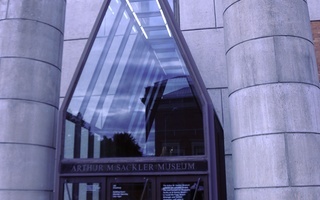 Shouting “people over profits” and throwing pill bottles on the floor, more than 30 demonstrators held a “die-in” in Harvard's Arthur M. Sackler Museum Friday to protest its connections to a family they said spurred on the opioid crisis and profited from addiction nationwide. Led by photographer Nan Goldin—whose works are displayed in the museum—protesters demanded Harvard refuse future funding from the Sacklers. They also urged the Sackler family to invest in the overdose reversal drug naloxone, safe injection facilities, and medication that can combat addiction. They charged that the family, which helps lead the multi-billion dollar drug company Purdue Pharmaceuticals, knew the pain relief drug OxyContin was highly addictive but downplayed its dangers when marketing it to doctors. The Sacklers have drawn widespread criticism in recent years for the role some say the family played in spurring the nationwide opioid crisis. Though family members descended from Arthur M. Sackler—a philanthropist and drug marketer—do not have shares in Purdue Pharmaceuticals, his brother’s descendants have served on the company’s board. The family has also donated extensively to Harvard, paying for the Arthur M. Sackler Museum, one of the museums that comprises the Harvard Art Museums and houses the University’s collection of Asian, Islamic, and Mediterranean art. 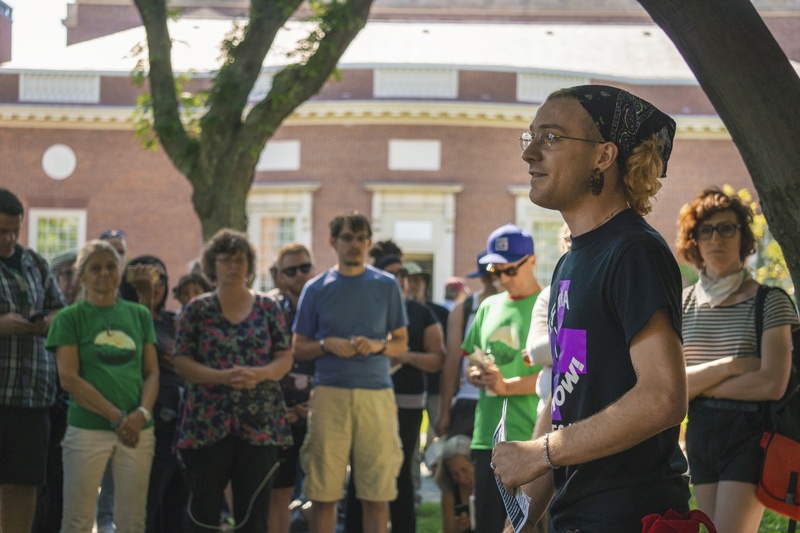 Medical School students and the Center for Popular Democracy’s Opioid Network—a band of more than 45 grassroots organizations that have formed in response to the opioid crisis—organized the demonstration. This is not the first time the Sackler’s donations have drawn criticism from Harvard affiliates. In January, Goldin urged the Art Museums not to accept donations from the family because of what she called their role in starting the opioid epidemic. Several members of the advocacy group Prescription Addiction Intervention Now, which Goldin founded, attended Friday’s protest. Demonstrators said they attended the “die-in” both to protest the Sacklers and to call for immediate action to fight the opioid epidemic. Mardge H. Cohen, a doctor at Boston Healthcare for the Homeless, said she came to the protest because she is “upset and horrified” about the number of preventable deaths from opioid misuse. 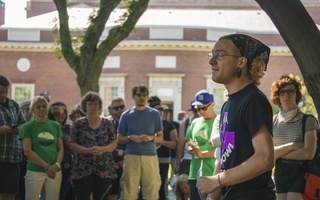 Harvard Art Museums spokesperson Daron J. Manoogian declined to comment on the protests. A previous version of this article incorrectly stated that Arthur M. Sackler played a major role in distributing OxyContin. In fact, Sackler died nearly 10 years before the drug came to market. —Contributing writer Isabelle Agee-Jacobson can be reached at isabelle.jacobson@thecrimson.com. 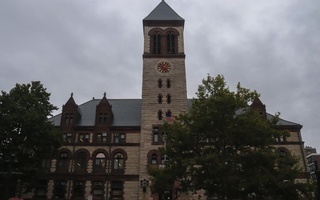 We believe historical clarity is necessary before coming to a firm decision about the foundation’s moral culpability and Harvard’s decision to accept its funds.